Something brought the memory rushing back this morning – a smell? a sound? the taste of the air? 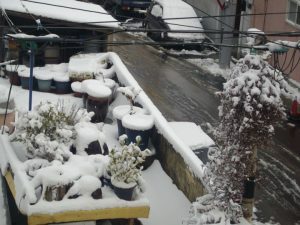 Suddenly, overwhelmingly, I was back in my small, warm apartment in Daegu, looking out of the window on a snowy morning. Kimchi pots. Kimchi is the tangy, spicy, fermented-cabbage taste that pretty much is South Korea. It’s an acquired taste, but once you’ve acquired it, it stays with you. Years after leaving Korea, I still crave kimchi from time to time. Most families make their own kimchi according to old family recipes. Kimchi is traditionally fermented in big clay pots. “Pots” in the sense of traditional African clay pots, not pots you use on a stove. The kimchi pots are traditionally kept on the flat roof of the building during the cold winter months. Wealthy modern Koreans may have a dedicated kimchi fridge for making kimchi. Most people, however, still keep the traditional pots on the roof. From my window, I look out at the roof next door. Just down the street, the wind is ringing the bell at the little suburban temple. On the roof, a blanket of snow lies heavy and white across the brown kimchi pots. It’s the first thing I look at on a snowy morning, standing here in my little apartment with my morning coffee. A sudden vivid memory on a chilly early-winter morning.